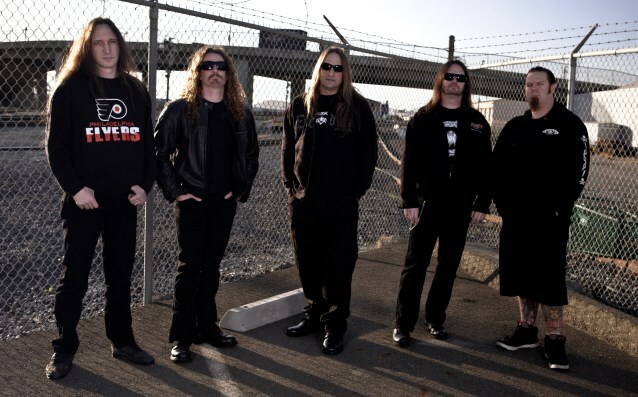 Legendary thrash metal band EXODUS has signed with Breaking Bands LLC and The Agency Group. Breaking Bands LLC is directed and founded by the powerhouse team of TESTAMENT vocalist and co-manager Chuck Billy, Adrenaline PR CEO Maria Ferrero, and former Megaforce Records and Crazed Management owners Jon and Marsha Zazula. Ferrero states: "Working with EXODUS in this capacity has been an ongoing conversation that we finally solidified. "The band and I have a continuous history, since 1984, to be exact. I am a true fan of their music, so I look forward to being a part of taking this band to the highest level." "EXODUS has been ready to explode for years and the time has come. "2014 will be the year that EXODUS blasts off to an unstoppable assent like never before. We can't wait to be part of it." States Billy: "I'm excited to be a part of this. I am forever Bonded By Blood!" The Agency Group is known for booking some of today's biggest and best artists. EXODUS is proudly represented by agents Dan Rozenblum in North and South America, and Tom Taaffe in Europe and Asia. Rozenblum states: "EXODUS remains as one of my favorite bands of all time, and words cannot describe how pleased I am that we are now able to assist the band to reach fans around the globe." Taaffe adds: "EXODUS is one of the most integral bands in metal music from the last thirty years. The amount of bands that they have influenced is staggering. It's great to be working with them and it's an exciting prospect that The Agency Group will be taking them to all corners of the globe going forward." EXODUS recently announced its participation in a monumental upcoming tour with headliners SLAYER and additional special guests SUICIDAL TENDENCIES. This metalhead's "dream tour" kicks off on May 9 in Salt Lake City, Utah, and hits six more cities, including a stop at the world-famous Rock On The Range festival on May 17 in Columbus, Ohio. Gary Holt will perform double-duty on this run as guitarist for his band EXODUS, while also filling in for SLAYER's fallen guitarist Jeff Hanneman. Holt recently told "Metal Zone" host Nikki Blakk of the San Francisco, California radio station 107.7 The Bone about his plans for a new EXODUS studio album: "I'm heavily in riff mode [right now]. It's always hard to gauge where a record's going right away, but you kind of get a feel for where you're headed mentally, and right now it's really fast. It's ridiculous.